Seychelles is a beautiful island off the east coast of Africa. It is in fact a group of 115 islands. Indian nationals get free Visa is on arrival in Seychelles. Seychelles national carrier Air Seychelles operates daily flight to Mumbai five times a week. Srilankan Airlines offers one stop connectivity at reasonable rates from various Indian cities. I have heard a lot about Seychelles hope to visit soon. Seychelles should definitely be on your bucket list! Below are some of the best things about Seychelles that define why you should plan your visit to Seychelles soon. Curieuse island and its sea coconut! Curieuse is a small island north of Praslin. It is popular for its red coloured soil and more importantly, a local variant of coconut, called locally as Coco De Mer or sea coconut or Lodoicea. The only other island where the legendary Coco de Mer, the world’s heaviest and leargest nut, can be found is the UNESCO World Heritage Site, Vallee de Mai, on Praslin island. Curieuse island is the only uninhabited island where the Aldabra tortoise roam freely and can be seen in their natural habitat. Aldabra tortoises are the heaviest and oldest land tortoises in the world, found in Aldabra and other islands of Seychelles. These land dwelling tortoises live for about 80 to 120 years. A day excursion to Curieuse island can be done from Praslin, during which one can explore Mangrove forests, Takamaka trees, Aldabra tortoises and more. Curieuse Marine National park has many walking trails. At the harbour, giant hump headed parrot fish can be spotted, which can be as long as a meter. A popular beach with a lot of water sports, parasailing, scuba facility or just plain swimming, Beau Vallon is ideal for visiting with kids, as there are no sharp rocks/corals and no risk of strong currents. 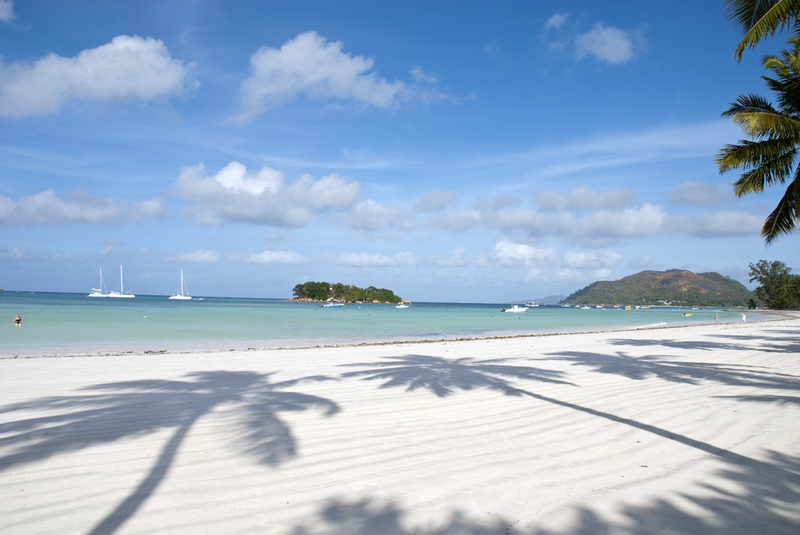 Innumerable restaurants and resorts make this beach area in Seychelles highly desirable. Anse Intendance is a popular surfing location in Mahe, Seychelles. Kids can try a bit of rock climbing as well. The postcard perfect location is about 20 miles from Victoria and is easily accessible by public transportation. 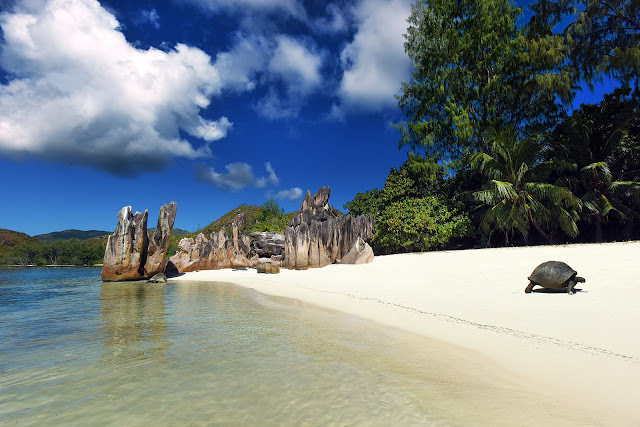 Anse Volbert also known as Cote dór beach is located on the second largest island in Seychelles, Praslin. It is the most famous beach there and offers a long stretch of white powder sand and crystal blue waters to its visitors. Seychelles was once a hub of spice trading. The Le Jardin du Roi Spice Garden in Mahe, open from 10 AM till 5 PM, gives us a flavour of the rich past and helps visitors familiarize themselves with wide range of spice plants and herbs. Besides exploring herbs, visitors can try hiking, enjoy great food at in-house restaurant, and shop and take home special spices. 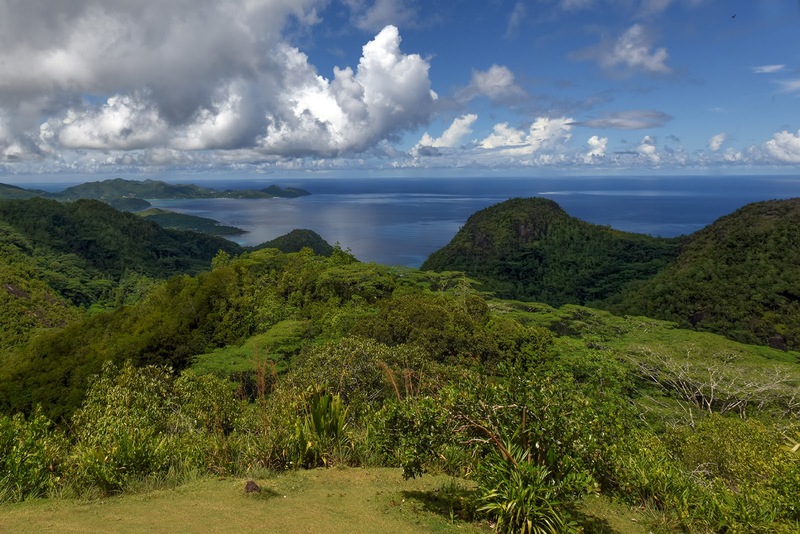 Seychelles has a lot of national parks. 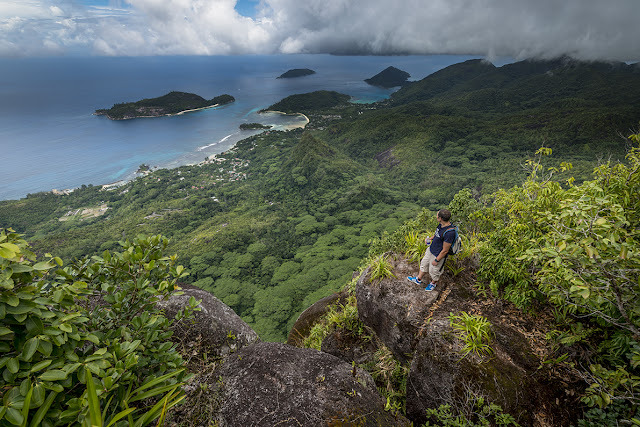 Morne Seychelles National Park in Mahe and Vallée de Mai Nature Reserve in Praslin are highly recommended for hikes and trails, while Ste Anne marine national park provides a glimpse into the beautiful marine life of Seychelles with the best snorkelling and diving sites. Spending time up close with nature will fully refresh and energize you. An entry fee applies but is totally worth it. One should definitely try some cycling on the third most important island of La Digue, it is an almost car free island and houses the ‘world’s most photographed beach’ – Anse Source d’Argent. Indian food is available in Seychelles along with three Indian restaurants in Mahe. Thus, finding preferred food or vegetarian food is not a difficulty. A wide range of accommodation options are available, ranging from affordable local guesthouses and small hotels, luxury and ultra luxury resorts to private island resorts. To summarize, one week in Seychelles will let you explore the best of nature and marine life. A lot of exciting stuff awaits anyone who visits this place and I believe a trip will certainly be worth it. Update: Also consider St Denis/Reunion Island, to which direct flights are available from Chennai. Details here. Amazing island. Nice to read about Seychelles.